Originally designed for high volume freeways that were never built, Granville Bridge presents significant accessibility and safety challenges for today’s urban context. Addressing these challenges by improving conditions for walking, rolling, and cycling are key to accommodating the growing number of people living, working, and playing in the city and region. Our engagement process will also include opportunities for big ideas around public space such as art, seating, and lookout stations to provide scenic views from the bridge. The first phase of our public engagement process is underway. We’re seeking feedback on the proposed goals, how you use the bridge today, as well as your aspirations for the kind of connection Granville Bridge could be. Take our survey to provide your feedback. The survey is available until May 10, 2019. Granville Bridge was designed to connect to high-speed, high-volume freeways that were never built.The freeway-style design presents significant safety and accessibility challenges for today’s urban context. Steps in the sidewalks at crossings make the bridge inaccessible for people with mobility aids such as wheelchairs and scooters. Unsignalized crosswalks at vehicle ramps feel unsafe and contribute to motor vehicle collisions. No cycling facilities across the bridge means people cycling either share a travel lane with high-speed motor traffic, or mix with pedestrians on the sidewalk. This project email newsletter will provide updates on construction, opportunities to provide feedback, and final decisions by Council. Here is our timeline and anticipated milestones. The timeline is subject to change based on input and direction by Council. Council approves moving forward with public consultation to inform improvements along the bridge. We’re seeking feedback on the draft goals, how you use the bridge today, and your aspirations for the kind of connection Granville Bridge could be. We’ll report back on what we heard in Phase 1, and reach out to present and hear your feedback on high-level design options for improved walking, rolling, and cycling connections on the bridge. We’ll report back on what we heard in Phase 2 and present an evaluation of the design options. The proposed design will be presented to Council for review. Pending Council approval, this timeline will be updated to reflect implementation. 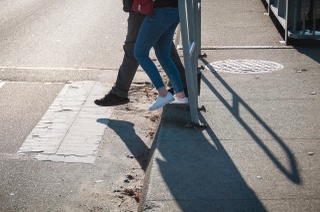 April 4, 2019 – City launches public consultation process to inform the design of a new walking, rolling, and cycling path along Granville Bridge. January 30, 2019 – Council unanimously approves moving forward with public consultation to inform improvements along Granville Bridge. City staff provided a high level overview of upcoming projects impacting the South Granville neighbourhood, including Broadway Subway, Granville Bridge, and Arbutus Greenway. The proposal for improved walking and cycling facilities on Granville Bridge is approved by Council as part of the Transportation 2040 Plan. When complete, the Arbutus Greenway will enable you to walk or cycle continuously from Marpole in South Vancouver to False Creek.